China is a huge nation and local cuisines vary a lot from one to another. One typical local food may not be accepted by people from other places. But there is an exception and that is "hotpot". Hotpot has a history of almost 2,000 years in China. Initially, it was only popular in the coldest areas of north China. But with improved cooking methods, hotpot developed a few regional variations and was gradually accepted by people all across China. During winter time, relatives and friends would gather together around a cooking pot, dip-boiling meat or vegetables into the hot broth while chatting about all kinds of topics. It is definitely a warm and entertaining pastime. The act of "shuan"(涮shuàn) or placing items into the hotpot, is very special. You can shuan at a relaxed and leisure pace, putting bits of food into the broth and then taking them out to eat either with dipping sauces or other condiments. The cooking time is usually short and therefore the meat and vegetables are tender and fresh. 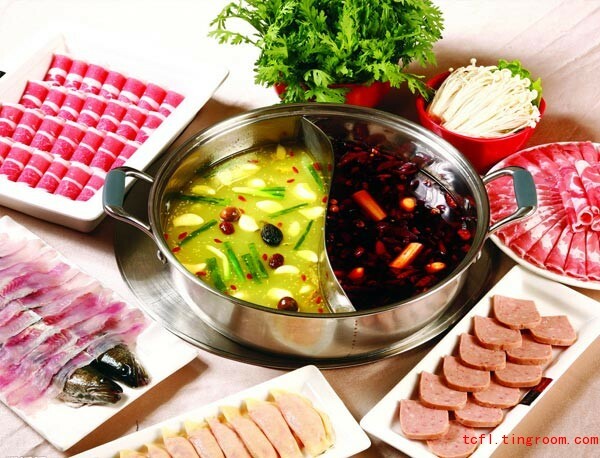 Typical Beijing hotpot, or the northern style hotpot, with sliced mutton as the main item, is well-known in China. More than 600 years ago, the dish of hotpot was introduced to Japan and at present, many people from countries around the world are starting to love hotpot as well. What is the most common hotpot? In China, the most common hotpot is called "yuanyangguo"(鸳鸯锅 yuān yāng guō). The yuanyang(鸳鸯), or mandarin duck, is a beautiful bird. In Chinese culture and folk tales, mandarin ducks have always appeared as a couple. If one of them died, the other would soon follow suit. When people enjoy the dish of hotpot, some like it spicy, some do not. Therefore, a new type of pot was invented. The pot is divided into two parts, with one part light broth and the other spicy broth, just like the pair of yuanyang or mandarin ducks, never being separated. The hotpot itself is named yuanyanguo.